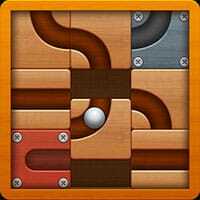 Roll the Ball is a fun brain teaser puzzle game, where you slide tiles to get the steel ball to the bottom. There are 60 levels waiting for you. Your aim is to put all blocks in right place to make the ball rolling from the start point to end point. How many levels can you get? Roll the Ball Game is one of our Puzzle Games at Round Games. It is also tagged as a logic and brain game. To play even more free games, view our most played and all games pages. If you want to play more games like this game. Then you can simply check out the games inside the game tags that are the most relevant to your interests. Or check the Puzzle Games category or check the related games section at the end of the game page.